Bellmouth Reducers | Piping Technology & Products, Inc. 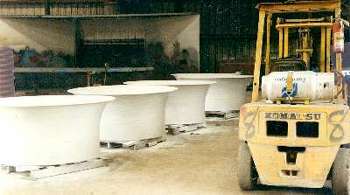 The picture above shows four bellmouth reducers which have just received the final coat of a special paint. These are components of the cooling water piping system designed for large, new petrochemical complex. The bell shape is a segment of an ellipse chosen to function as a vortex breaker during high velocity flow. Need bellmouth reducers for an upcoming project? Let us price it for you today!